Note: Walkthru starts from the town of Helada. It's time to embark on your journey to find the wonderful NON-SLIPPERY shoes by Percel, our friendly neighbourhood Shoemaker. Leave the town from the west (left) exit. Okay, climb to the top and get off the ground on the right. Keep going right, avoiding the falling icicle. Exterminate that pesky green slime monster. Keep moving right, avoiding the second falling icicle. Now, climb down the vine. Get rid of any unwanted guests. 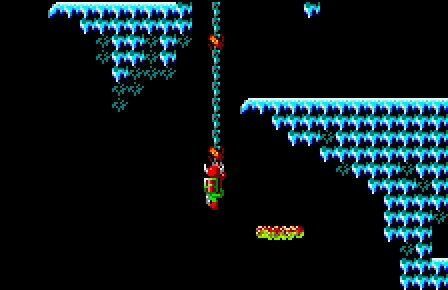 Now, keep going right, watching out for that icicle aiming for your head. DO NOT climb the vine. Just simply fall down from the opening. When you fall down on the pillar, be sure not to loose balance and slide down to the right. If you do, unfortunately slide down to the right, then climb vine, go right, climb next vine, go left, fall down and then fall down to the right again. From the pillar fall down to the left. Climb down the vine and go right. This is the good part people! Do not travel across the chasm via the moving platform. Just take a chance once in life. Take a bungee jump, without the rope. In other words, fall down. Tada! You've got Percel's famous Ruzeria shoes . Wear them (Enter, , , Enter)and experience the anti-slip affect. Now fall down to the right and climb down the vine. Annihilate the torotise. If you're low on health. Go right jumping across the chasm and thrust your sword into the dead-end. You'll find a potion waiting for you there. Otherwise, go left and climb down the vine. From here you can retrace your steps. Go left, climb vine, go left, climb down vine, get on platform, climb second vine, go left, climb vine and jump off the vine to the right. Go into the town of Helada. First of all goto the Sage and See your Power. Maybe she'll increase it, becuase you just found the famous shoes. It's also a good time to Record your experience because you'll be visiting Mr. Bad Guy pretty soon. Also if you haven't bought the Honour Shield as yet, then exchange yer almas and buy it. If you're low on money, goto the previous town and exchange your almas, because the bank there gives you a whopping 8 gold for 1 almas, the highest rate for 1 almas you'll ever get. Now it's time to meet your destiny. Leave the town from the west(left) exit. Go right. Hitch a ride on the moving platform and enter the Green Door. I'll let you handle it from here. It's pretty easy now. If you still having trouble, then contact me via twitter. I'm always there.